We had a great experience with this dealership and love our new car. Ziad was very professional and always available to talk. He also set up delivery for the car and that was a really nice benefit. we were looking to find a vehicle and seal the deal, without a whole lot of hoopla, as patience and time were limited. dina and mikel helped us do just that. we were completely satisfied, as we drove out of the lot. however.... i have either purchased or leased a handful of vehicles in my life, all from various dealerships around northwest Ohio, and all have come with a full tank of gas. our new SUV came with less than a quarter tank. strange. it is a good thing i glanced down at the display, on my commute into work Monday morning, otherwise i would have been stranded on the turnpike. I have had an excellent experience, they went above and beyond taking care of me. Dina drove 2 hours to pick me up since I needed a ride. The customer service experience was second to none. Steve and Mikel were excellent...not only friendly and knowledgeable, but also honest and transparent throughout the purchase of my first Mercedes-Benz. Concierge service with John was great actually having someone walk you through the ins and outs of your new car was most helpful. Lastly I really appreciated meeting the GM Jason. Again excellent team and experience. Our family has bought both an Audi Q5 and Audi A4 from Vin Devers. Whenever we are looking for a vehicle, new or used, we always call Chris Stang first. Chris is extremely knowledgeable of both the Audi and Mercedes brands and a true pleasure to work with. No matter what we need, Chris has always made himself available to assist us, and I don't mean just during the purchase either, I mean always. Chris is a true "car guy" and consummate professional. Layal in finance was wonderful to work with and we have a great relationship with Kurt Morin the new car manager, a true gentleman, who has helped make all our purchases very easy. 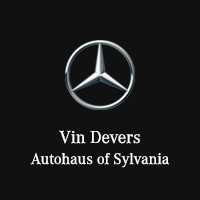 You really need to meet the staff at Vin Devers to understand what a great place it is to buy a vehicle.